I recently posted a version of the graphic below with caption: “Not perfect, but close. It’s about right.” The response was overwhelmingly positive. A great majority of people recognized it as a unique comparison, one that they had never seen before, and also an accurate comparison that effectively captures differences that actually exist. My intent in producing the graphic was to address the decades-long confusion that has existed between TPS and Lean, and to help people understand the critical differences. It was also to help people realize why they are often unable to achieve much success with Lean despite a lot of effort over many years. The graphic presents factual differences and also shows how the interpretation of TPS by university researchers changed over time. My aim is to help people recognize how these differences shape the results that they achieve and the impact on people (particularly employees, as well as suppliers, customers, investors, and communities). Nearly 30 years ago, Lean was presented as the generic version of TPS. Actually, Lean was an interpretation of TPS – a rather poor interpretation. Then, over time, Lean drifted farther away from TPS, thus making it far less of a generic version of TPS and more its own unique thing. In other words, the interpretation of TPS got worse over time instead of better. It is clear that TPS and Lean are not the same. The differences between the two are many and significant – especially in the details. But, if “Lean” is meant to be the generic version of TPS, then Lean is obviously best represented by the red column, TPS, not the blue columns. In other words, if Lean is truly the generic version of TPS, then the ingredients should be nearly identical – but they are not. The graphic does not argue against Lean success or the useful learning that will come from it. It merely points out important differences between TPS and Lean. Understanding these differences can, in turn, help people re-focus their attention back towards TPS and The Toyota Way (“Continuous Improvement” and “Respect for People”). The graphic above is a high resolution image that you can copy (click on image to enlarge and save). Click here to download a print-quality .pdf file of the graphic. You can use the graphic to reflect on your own understanding of TPS and Lean; in your training and teaching of TPS or Lean; or to stimulate discussion and deepen the understanding of TPS and Lean in your organization and between you and your suppliers. Perhaps it will result in needed corrections that help put you on a path closer to Toyota’s management practices so that you can achieve better business results and better outcomes for people. The graphic includes several questions for you to contemplate. Why are there differences between TPS and Lean? Why did Lean drift farther away from TPS over time? How do the differences affect outcomes? What is the impact on business results and on people? What should you do if your Lean efforts don’t produce significant business results? Should you move towards TPS? In what ways does the graphic reduce confusion between TPS and Lean? Toyota does not practice Lean. Why? TPS represents actual business needs that are common among most businesses, while Lean does not necessarily reflect actual business needs (for example: Maximize Customer Value, Perfect Processes, and Perfect Value). Does Lean reflect your actual business needs? And finally, I’d like to leave you with a thought to ponder: Anyone can know Lean, but nobody can know TPS. You seem to have an underlying presumption that TPS is best. If I had a fledgling auto company with ambitions to be competitive world wide I think I would be trying to model Hyundai/Kia rather than Toyota. Many Lean efforts are far afield from the auto industry and they are different from TPS out of necessity rather than because of a lack of appreciation for TPS. One problem you didn’t point out with Lean is that as Lean has penetrated other industries (healthcare anyone?) we have Lean leaders that neither understand TPS or the industry they are trying to fix which is not a recipe for success. 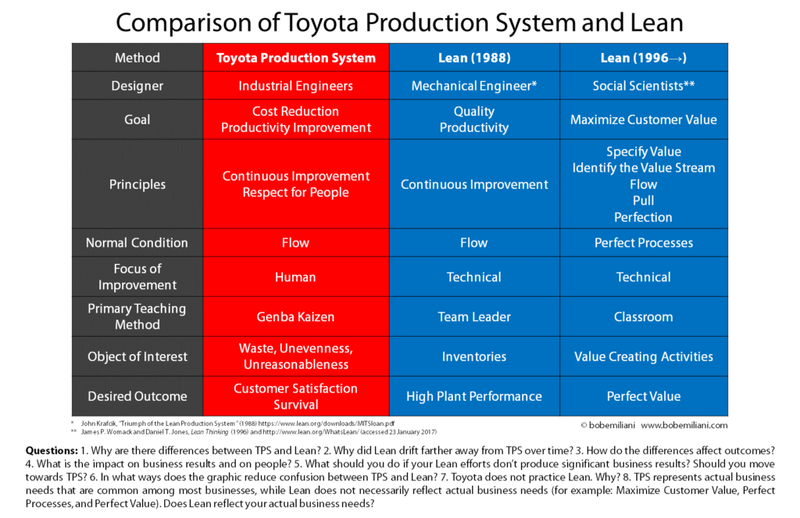 My comparison pertains management systems (TPS and Lean, which are not the same), not automobile companies. Decades ago, Hyundai’s chairman told his automobile division leaders to do what Toyota was doing. So the roots of Hyundai’s success are partly rooted in Toyota’s pioneering work. Toyota is still one to watch and learn from due to their unique way of thinking. My work, and this blog, has long been devoted to leadership – specifically, their misunderstanding and misapplication of TPS/Lean, regardless of industry. Thanks for pulling out the question about what TPS and Lean (Thinking) have in common (or not). From my perspective and experience within small and large organizations (like BMW) TPS is seen as the “father” of what seems to be applicable to any other organization in a more generalized way. However the most profound difference of TPS and Lean (Thinking) is that the Toyoda family caught on continuous improvement, Poka Yoke, and other ideas what have become prevalent in TPS later on for decades. The foundation on which Toyota has put on TPIS is a long cultural history on how things were done at Toyota (starting with the loom business at the end of the 19th century). This is never really taken into account of anyone writing about TPS or lean management. TPS as we see it today, and managers visiting Toyota plants often are astounded, is just the to perfection driven “early seeds” brought to excellence in a crisis (when Toyota almost was on the brink of bankruptcy after the WW II). Similar as the Camellia japonica brings out most astonishing blossoms after the flower (often in form of bushes) has struggled through the winter. Underestimating the culture of an organization, its people and its sub-cultures, and not naming the challenges and realities with it brings only out a superficial kind of TPS which we then call “lean”. Seldom this holding a complete view of the organization and its sub-systems (inside and outside). Curious what you think on this perspective of mine. Hi Ralf – Yes, your perspective has merit. I discussed this in a brief blog post “Copying Toyota.” I think you will see we are in agreement. I find your work really interesting so I was curious, if you were to to reproduce your graphic for a service organisation only, say a bank, would you make any changes? No, not really. Object of Interest and Desired Outcome might be different for the 1988 version of Lean. Inventories could be bank products/services – likely, too many (80/20 rule). Plan Performance can easily be Bank Performance. When you understand service organisation characteristics of production, there are some important differences from manufacturing, that I would suggest alter some of the elements of the table. So, is it altering TPS, and moving into ‘Lean’. I believe that the definition of TPS are the principles behind it. Using those principles with different systems necessitates designers like myself to use whatever tactics that will follow the principles. One, amongst others, of the most important differences between service and production systems is that the service user is involved in co-production. Object of interest – value creating activities based on purpose. Designer – managers & front line specialists. Goal (purpose) – according to the requirement of the service user. Lastly, I am using the term TPS as the name for the whole leadership/management system and style of Toyota, not just the TPS. I have always developed approaches with the initial thought – what would Taiichi Ono do in this system? I would be interested in different empirical evidence of this, as I know that these are only my learnings from doing this over 15 years. You must release and focus the three dimensions possessed by ‘all’ your people. Talent; the ability to do existing tasks well. Creativity; the ability to continuously improve what they do and the way they do it. Enthusiasm; the strong emotional ability/energy to want to do both. Lean without TAS, is like a body without a working heart. — A corpse. ‘THE ROLE OF A STAR MANAGEMENT TEAM IS TO MAKE THEIR PEOPLE SHINE’. Two of my favourite Drucker quotations sum up what we need to do next. If you want one hundred years of prosperity grow your people”. “We know where most of the creativity, the innovation the stuff that drives productivity lies, it’s in the minds of those closest to the work. Management is about tapping into this ocean of creativity, passion and energy that as far as we can see has no bottom or shore”. And sadly, after all these years most people still don’t get it! Let us give the final word to Sensei Ohno.